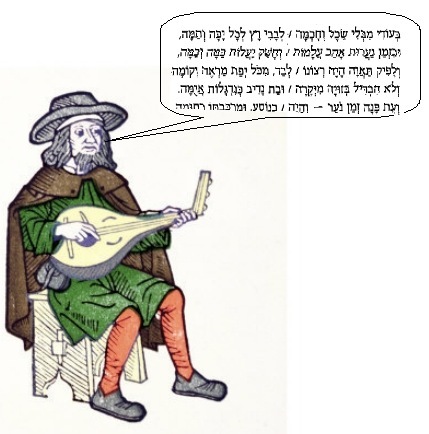 A Hebrew Troubadour in Spain? Troubadours were Western Europe’s first highbrow poets to sing in the vernacular (French, Portuguese, German, etc.) as opposed to in Latin. Troubadours did not invent vernacular poetry. People have always sung in whatever language they spoke. What has new about the troubadours’ work was that they wrote and performed songs in the vernacular language for kings, queens, and other super-élites. Why was this new, all of a sudden, at the end of the 11th century? Before that time, sophisticated poetry written by educated people was written in a classical language such as Latin, Greek, Hebrew, or Arabic (depending on what part of Europe you were in). Songs sung in the languages that people actually spoke in daily life were everywhere (as they are now), but it was not the type of thing that was acceptable to perform at court, and even if it were no kings were paying poets to write down and perform original songs in French or Portuguese or Italian. Not until the troubadours. Back in the 11th and 12th centuries when troubadour poetry first flourished, poetry played a very different role from nowadays. These days we tend to think of poetry as some kind of rarefied activity that takes place in dusty libraries or snooty salon parties, or at its most accessible in live performances of slam poets at bars and coffee houses. In medieval Europe, court poets were more like high-profile media figures whose verses communicated political propaganda, shaped the habits of speech and thought of the upper classes, and were rewarded with salaries and bonuses comparable to those of a modern day business executive. They were like studio executives, Mad Men, and rock stars rolled into one. While today we might trot out a poet laureate once or twice a year to recite a few lines at a presidential inauguration or other ceremonial event, medieval troubadours were in the news constantly. They were celebrities. The first courts to support troubadours who wrote and sang in the vernacular were in the south of France, in places like Aquitaine and the Midi. The first such poet was himself a nobleman of very high rank, William IX of Aquitaine (try to imagine Al Gore making records as good as those of Jay-Z and you’re getting warm). Like modern pop stars, the troubadours cultivated dynamic stage persona, penned autobiographies or had them ghosted by others (razós), and tended to embellish their personal lives in their songs. And much like our hip-hop artists, they matched wits in poetic battles (tensós) that often turned ugly and left participants with hurt feelings. The troubadour style spread from the south of France north into Germany (minnesingers) and south into the Catalonia and Castile regions of what is now Spain (trovadores). Some 150 years after the whole troubadour style got started, a number of troubadours from France, Spain, and Portugal found their way to the court of Alfonso X ‘The Learned’ of Castile. 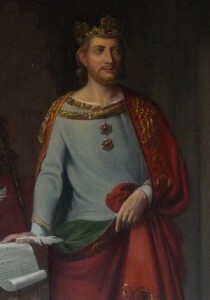 Alfonso was a prodigious patron of the arts and sciences who himself was an accomplished poet who composed some 200 songs in praise of the Virgin Mary in Galician-Portuguese dialect. At the time of Alfonso’s reign, Castilian (aka Spanish) was used for a lot of things. There were law books, scientific manuals, philosophy books, and works on astronomy, for example. However, when it came to lyric poetry such as love poetry, the languages of choice were Galician-Portuguese and Provencal. Because of this, all the poets at Alfonso’s court, and even Alfonso himself, wrote and performed their work in these languages instead of in Castilian, which was the language of nearly everything else that went on at court. The one exception at court was a Jewish poet named Todros Abulafia [see my last post on Abulafia and his modern critics], who wrote (as all Jewish writers did in the 13th century in Spain) in Hebrew. He wrote poems on nearly every subject imaginable, leaving behind a collection of some 1200 poems that he himself edited in 1298. He wrote a number of poems dedicated to King Alfonso, and one must wonder if he actually performed them at court in Hebrew for an audience who in all likelihood wouldn’t have understood a word of them (except for the Jewish courtiers who probably would have). Abulafia was a notable of the Jewish community of Toledo, which at the time was a very well established community that boasted a centuries long history and was regularly represented at court since long before the Christian conquest of Muslim-ruled Toledo (Tulaytula in Arabic) in 1085. Under Alfonso’s administration there were several court Jews who served as financiers, outfitters, tax collectors, and the like. As a poet Abulafia was heir to a very rich tradition of Sephardic (Spanish Jewish) Hebrew poetry that dates at least back to the 10th century, when Andalusi courtier Dunash ben Labrat first began to adapt classical Arabic poetics to Biblical Hebrew language. This combination, something that was possible only in a tolerant, sophisticated courtly milieu such as that of ninth-century Córdoba, was cultivated by a series of major eleventh and twelfth-century Andalusi (al-Andalus was the Arabic name for Spain) Sephardic poets who are now considered the grandfathers of Hebrew literature: Moses ibn Ezra, Samuel Hanagid, Judah Halevi, and a host of others. If you attend high school in Israel you are tested on them in your exit exam (Hebrew Bagrut). So when Abulafia wrote of love, he often used a Hebrew style was based on the Andalusi Arabic poetry written in Spain in the 900s, 1000s and 1100s. Most of his love poems use this style, but at least a couple of them sound a lot more like the songs the troubadours were writing about their undying love for super-beautiful ladies. Abulafia’s experimentation with troubadour style was kind of a big deal. Jewish poets in the area around Toledo had been living in a Christian-dominated society for over 150 years when Abulafia wrote. Despite this, they pretty much stuck with the Andalusi style they had inherited from Jewish poets who had lived in Muslim Spain, or al-Andalus. In the eyes of most Jewish writers, the vernacular (Spanish, Catalan, etc) was not a language that was appropriate for writing poetry, and so they tended to downplay the importance of the troubadours, even if their Christian kings and queens thought otherwise. Abulafia was the exception. He was a master of the old Andalusi style, but was also an innovator who was not afraid to go out on a limb and try something new. This did not impress some of his modern critics, but it did not appear to have slowed him down when he was living and working at court. Quite the contrary. He was a popular man, and even accompanied King Alfonso on diplomatic missions abroad. So, you are probably thinking at this point, what was this troubadour poetry like? How did they sing about love? And how did Abulafia adapt their style in his Hebrew poems? 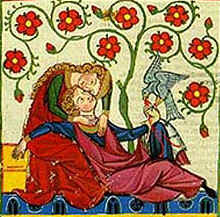 Troubadours wrote about love in a way that has come to be known as ‘courtly love,’ a kind of poetic game with strict rules about how lovers behave and how they talk about the experience of love. This courtly love style has survived to the present day, and popular songs on the radio still use some of its language and themes. The courtly lover served his lady like a knight serves a king. He sometimes sang of being her slave, of submitting himself completely to her. This adoration sometimes went over the line into a kind of heresy where they actually took to worshipping the lady instead of God. He would perform any service for her to prove this love, even if she never granted him physical affection. Troubadours described of a spiritual love that made them better people, more noble and pure. Here are a few examples of how troubadours at the court of Alfonso X sang of love, and how Abulafia followed their lead. E luec on m’en pogues jausir! in a place where I might enjoy her! even though I spend my life sobbing over her. her body, only to delight in her soul. que lhi dizer: e el assi fará! ant’ ela, todo lh’ escaecerá! what to say to her then: and the same thing will happen to him! in her presence, everything will slip from his mind! his pupils from looking upon her brilliance. There goes ‘that certain lady,’ Arise! Behold her beauty! I am her ransom and her sacrifice! to see her or to hear her words! a treadstone for her, and to like the dust from her foot! for truly then God shall multiply her reward! Never shall I ask for her to set me free! Here Abulafia doesn’t just follow the lead of the troubadours he worked with at court, he takes it to the next level, describing the scene in great detail, exaggerating, even parodying the skeptical friend who is converted to the same religion of love the poet practices. This is a bold move for a poet who comes from a scene where imitating your Christian neighbors is not usually rewarded. But then, he’s on the royal payroll, and isn’t dependent on the Jewish establishment of Toledo for his livelihood. This autonomy and bravado gets him into trouble in the Jewish community, but it does make for some pretty interesting poetry. Bonner, Anthony. Songs of the troubadours. New York: Schocken Books, 1972. (Anthology of English translations of troubadour poetry). Peire Cardenal. Poésies complètes du troubadour Peire Cardenal (1180-1278). Ed. René Lavaud. Toulouse: É. Privat, 1957. This post was written with support from the Oregon Humanities Center. Ten weeks of arguments, from Judah Halevi to Cervantes: or, yet another post on the survey course with a free, open-access course reader online! How Christian was Iberia in the Middle Ages? And how can you tell? This work by David A. Wacks is licensed under a Creative Commons Attribution-NonCommercial 3.0 Unported License. Based on a work at davidwacks.uoregon.edu.